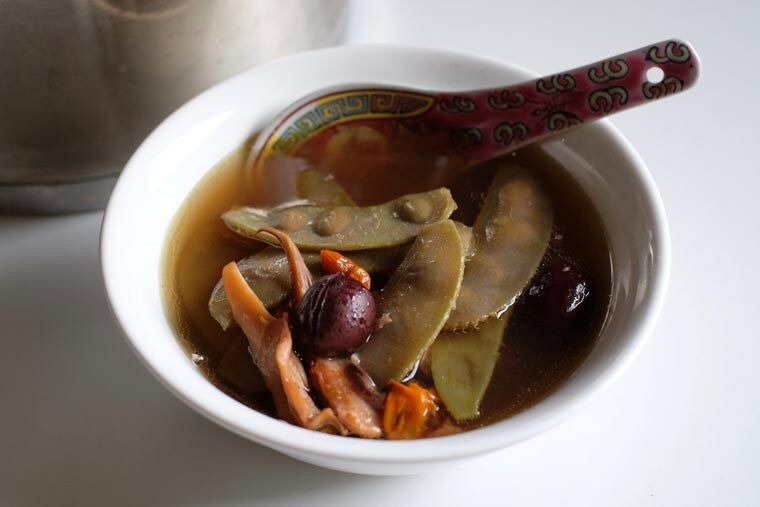 Even if you love Chinese soup, you may not heard of this ‘pang pi dou tang’ (彭皮豆湯). Hyacinth beans or Egyptian Kidney Beans, also known as pang pei dau in Cantonese, is not easily available. Unlike commercialised vegetables such as long beans or spinach, I’ve never seen this bean at the supermarket (despite frequenting many different supermarkets due to my job as a food writer/recipe developer). It is occasionally seen at the wet market, but even so it is extremely rare. My family gets our supplies from our friend’s garden. Hyacinth bean is a popular among the Indian community. It is used to making dhal and curries. In my family, we use it exclusively for soup. The flat green-beans gives a pleasant savoury-sweet flavour. Normally, we’ll make a huge pot of it and keep the leftover for another day – it tastes even better on the second day!